Place all ingredients in a blender. Pulse until smooth. Pour into an ice cream maker and churn until frozen. Scrape into freeze-safe container and freeze until further set (if need) or until ready to eat. Store any leftovers in a freezer safe air-tight container in the freezer. Hot, muggy weather is in full swing here in Baltimore. While I look forward to summer all year long so I can eat my favorite foods like cherries, nectarines, tomatoes and corn; I do not look forward to the weather that comes with it. It is this time of year I haul out my ice cream maker and make it earn its spot on the shelf. This sorbet is super easy to make, just a whiz in the blender (if you don't have a high-powered blender like a Vitamix, feel free to whisk the mix through a sieve before churning, I found the skins were well pulverized and did't bother) and then churn for a bit and voila, sorbet. It was ready to eat (though melting quickly) right out of the machine. You can store the leftovers in any freeze-safe container. When I was in Philadelphia a few weeks ago I picked up a quart ice cream container at Fantes at the Italian Market that I like a lot, it looks like real ice cream container! If I'm giving the sorbet to a friend, I have cardboard pint containers that I picked up at Williams-Sonoma last summer. So much cuter than just using the odd bowl. I digress! 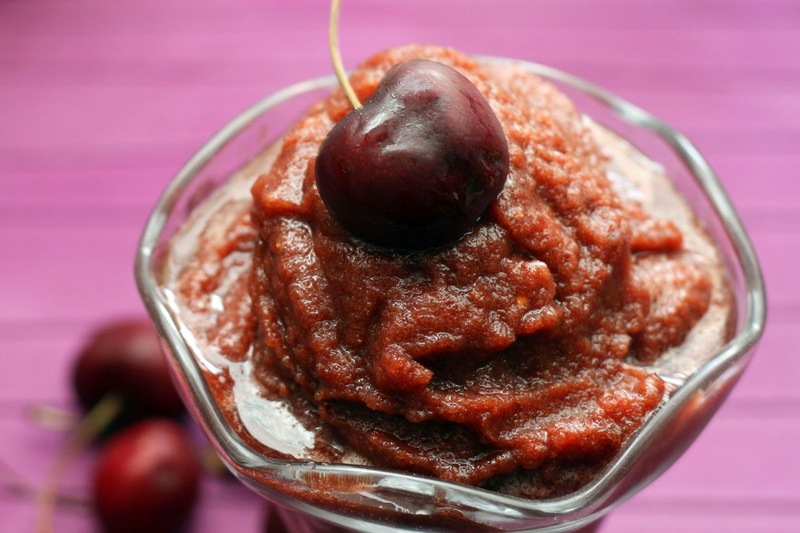 I love this sorbet because it really has a strong, true sweet cherry flavor. The beet juice is a bit of an odd addition but it doesn't make it taste like beets exactly, it just adds a depth of flavor and helps preserve the bright color. The ginger adds a zingy bit of spice.